Albert Einstein was a brilliant theoretical physicist, but he wasn't much of a clothes horse. He had a few tweed sports coats, a couple of bow ties, 347 lab coats, and that was about it. This amusing and fun Albert Einstein Dress-Up Magnet Set is an attempt to rectify that. 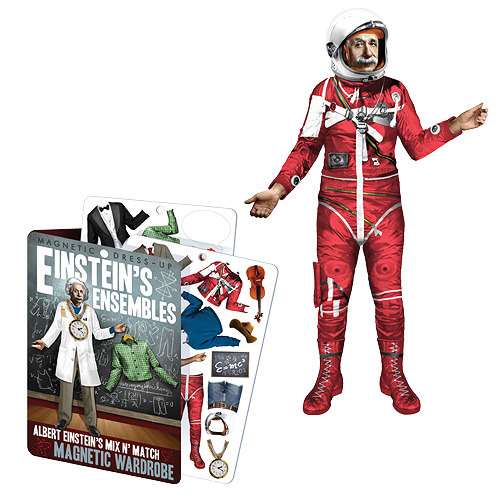 You get a magnetic Albert Einstein doll and 28 magnetic articles of clothing and props. Let your imagination run wild as you dress the world's favorite genius in jeans, outwear, and even a spacesuit! Make Albert look formal. Make him look funky. In the process, maybe you'll discover the creative genius inside you!